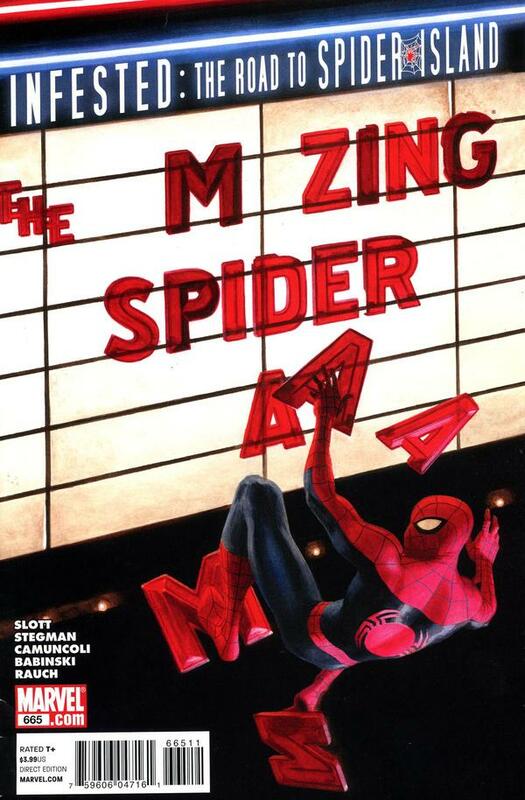 The idea behind this mantra goes back to the origins of Spider-Man in Amazing Fantasy #15. After being given incredible power by a bite from a radioactive spider, Peter/Spider-Man willingly fails to stop a burglar. The burglar goes on to murder Peter’s Uncle Ben, proving the greatest lessons are the hardest learned. With this incredible new power Peter was given, he discovered that he must use it for the force of good – to protect his friends and family and the citizen’s of New York and the world. To ignore this cause in favor of using his power for monetary or social gain would be plain irresponsible. 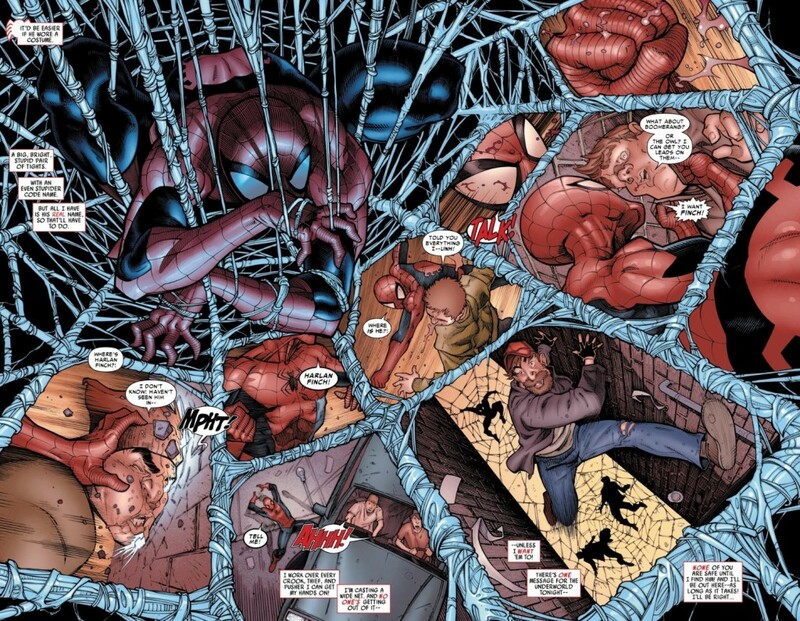 However, in ASM #665, Dan Slott has turned the idea of power and responsibility on its ear. When Peter’s long-time friend Betty Brant is severely injured by a mugger, Peter dons his Spider-Man costume and looks for vengeance. However, as he’s moments from capturing the criminal, Peter’s Aunt May calls, wondering why he’s not at the hospital supporting his friend. As Peter tries to skirt the issue, his Aunt May presses, before demanding that Peter honor his “responsibility” as a friend and family-member and get to the hospital. 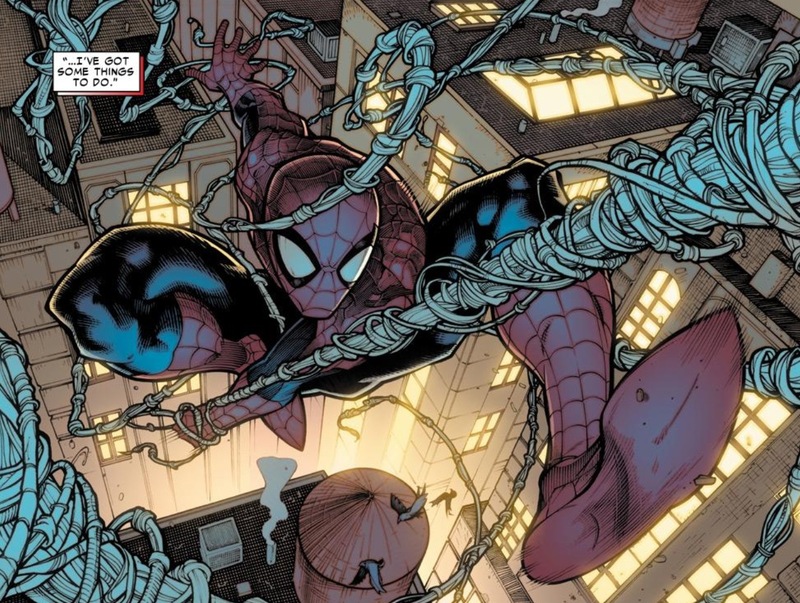 It was a bold and daring decision by Slott, and really one of the very few times where a creative team has put more value on Peter Parker’s responsibilities as a normal average member of society, rather than Spider-Man’s responsibilities as a superhero. Sure, there are hundreds of instances where being Spider-Man has gotten in the way of Peter having anything that resembles a functional family and social life. But I can’t think of any time in ASM where it’s been so forcefully implied that Peter’s decades-old code of honor may actually be irresponsible. What makes this accusation even more jarring is how Slott harkens back to Amazing Fantasy #15’s origin tale. As Peter tries to get Aunt May off the phone and bring Betty’s assailant to justice, she tells him she hasn’t been this disappointed in him since the night Uncle Ben died. When Peter is given the news by police, he immediately sets out to capture the villain. However, while the ultimate revelation that the villain was the burglar is one of the greatest gut punches in comic book history, the early ASM issues that detail some of the fallout from Uncle Ben’s death never really get into how Peter wasn’t there for his Aunt May in her hour of extreme need and mourning. And when you step back and think about it – Slott has a point. May has been a mother to Peter since he was a little boy. Doesn’t he owe this woman his presence to comfort her? What purpose does immediately bringing Uncle Ben’s murderer to justice really serve? His death still happened and is irreversible. But was it fair or even in character for May to bring this up to Peter in ASM #665? While no one but Mary Jane knows about Peter’s double life, he still is responsible to honor the powerful gifts he was given, regardless of the circumstances. If he has the opportunity to bring another criminal to justice, he has to do it, especially since he has the power to do it very easily. But aren’t we all responsible to our families first? In popular culture we often focus on those who value their work or other responsibilities above being there for their families. And typically, this attitude is viewed in a negative light. 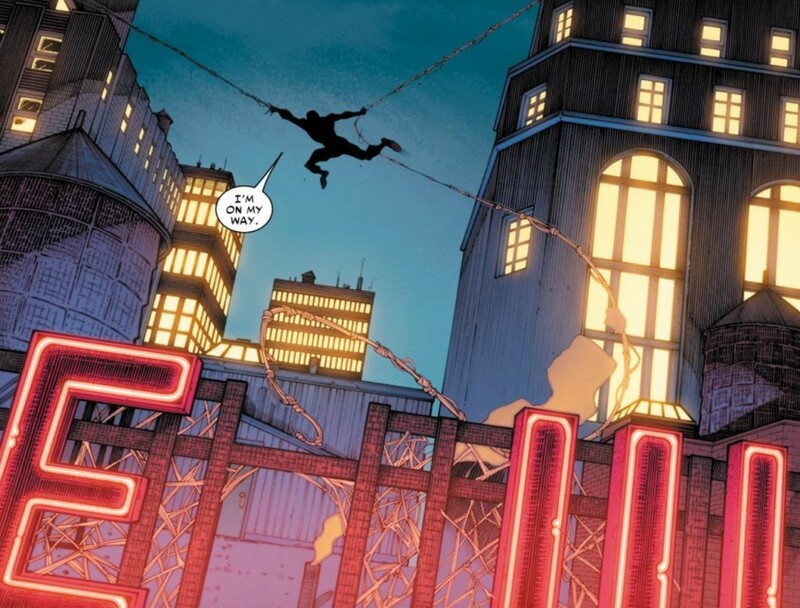 While I would never call Peter Parker selfish, when a close friend of his is injured, perhaps that is the one time where he needs to put the responsibility that comes with being Spider-Man aside and instead focus on supporting those who have always supported him, regardless of the circumstances or how vague/secretive/distance he’s been in the past. Betty Brant was Peter’s first girlfriend in ASM and has gone on to be one of his closest friends. As she lays unconscious in the hospital, does he do more good for Betty by her side, or out on the streets capturing a criminal? Of course Slott cheapens the severity of this decision a bit but letting Spidey have his cake and eat it too. He goes to be with Betty and after she comes to, he goes back out and still captures the criminal. I think the storytelling here would have been so much more dramatic and effective if Peter chose Betty and his family and the ultimate fate of the criminal was unknown. Because that’s how hard decisions are supposed to be. There are supposed to be consequences. Still, what has long made Amazing Spider-Man one of the best comic book series of all time was how the focus is not just on heroes versus villains, but on the people who wear the masks and how their actions impact the normal folks around them. 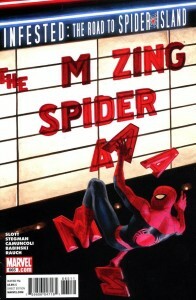 Considering how the creative team drops a bit of a bomb on readers towards the end of this issue and has decided to move Aunt May and her new husband out of New York City, I still hope that Marvel continues to come back to the idea that power and responsibility transcends just Peter’s relationship to Spider-Man, but additionally his relationship to all of those people around him. Being Spider-Man is a blessing and curse, but life is full of difficult decisions for people without super powers as well. Peter has had power since he was a teenager in high school, but he’s been held responsible for his actions for years before that faithful moment where he was bitten by a radioactive spider.